Our Tyvek® wristbands are made from synthetic paper called DuPont™ Tyvek®. It is water resistant and comfortable to wear making it perfect for short-term wear. 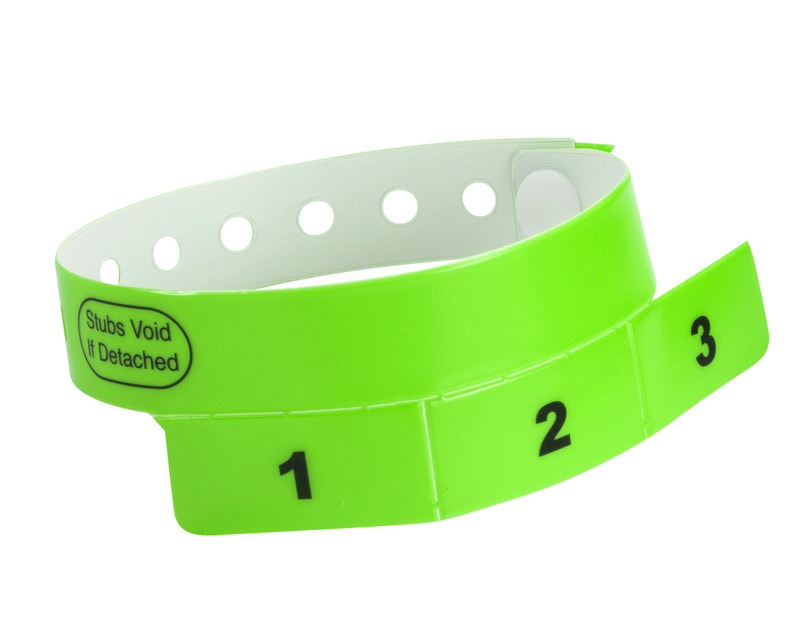 Each Tyvek® wristband is consecutively numbered for extra security. The back of the Tyvek® wristband is white, not the front color. DuPont™ Tyvek® is a unique, nonwoven material synthesized from compressed, high-density polyethylene fibers. The resulting fabric is incredibly strong and very lightweight. It has many applications wherever durability and tear resistance are necessary. 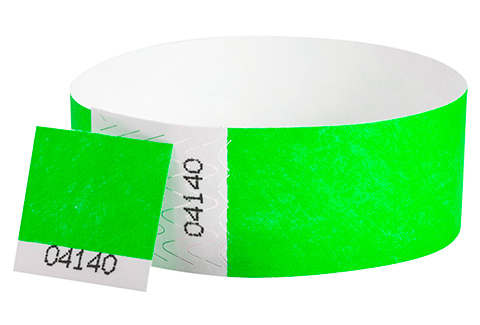 Tyvek® is ideal for event wristbands because it is comfortable to wear and can resist repetitive folding and flexing. It will easily last the length of your event, even if it gets wet! All our Tyvek® event wristbands are also fully recyclable, as polyethylene is similar to plastic bottles. Visit the DuPont™ site for more information on recycling. Each Tyvek® stub wristband has a removable 1" stub with a serial number on it that matches the serial number on the wristband. These wristbands are great for raffles, and a great alternative to tickets. They are water resistant and comfortable to wear. The back of the Tyvek® wristband is white, not the color or design on the front. 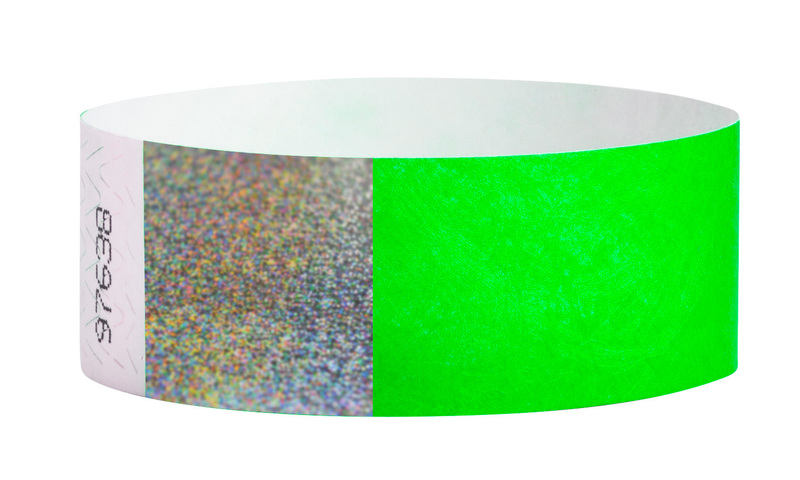 Each Tyvek® hologram wristband features a stunning hologram for added security. They are water resistant and comfortable to wear. The back of the Tyvek® wristband is white, not the color or design on the front. Vinyl On-Demand wristbands are made of durable polypropylene and printed using our high-speed thermal printers. As in the name, we can print on-demand and is 100% customizable. They are resistant to smearing, abrasion and are waterproof. The back of the wristband is white, not the color or design on the front. 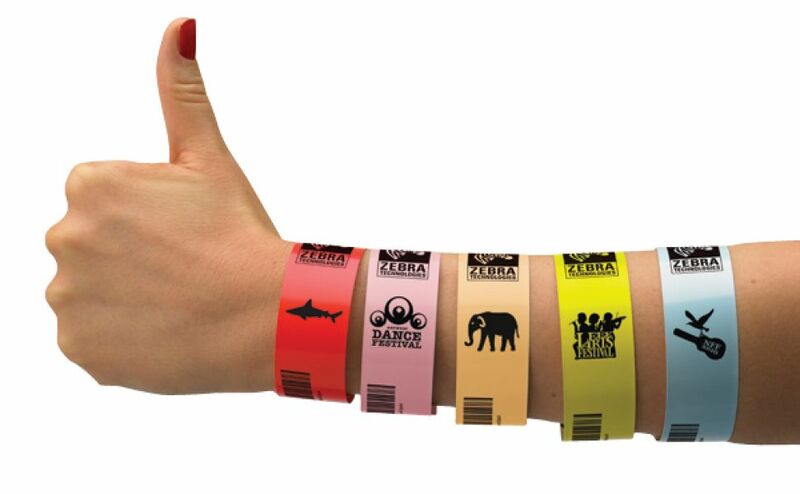 Plastic wristbands are made from a flexible and stretch-resistant plastic. 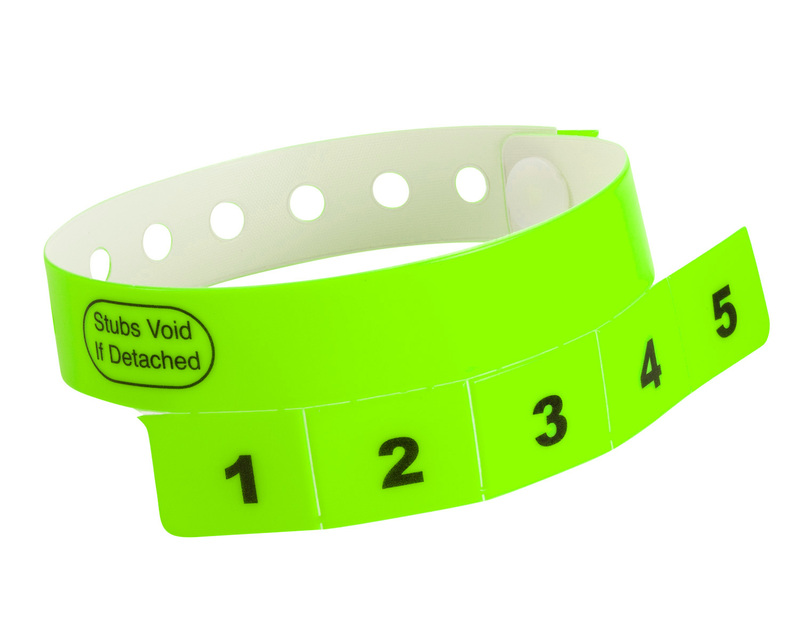 They are constructed with a one-time use, plastic snap requiring the wristbands to be cut off after use. The plastic bands are waterproof and hold up in water for extended periods of time. The back of the plastic wristband is white, not the color or design on the front. Plastic Holographic wristbands have a holographic imprint in the reflective color making them very secure and impossible to duplicate. They are also very easy to see in dark environments. The back of the holographic wristband is white, not the color on the front. 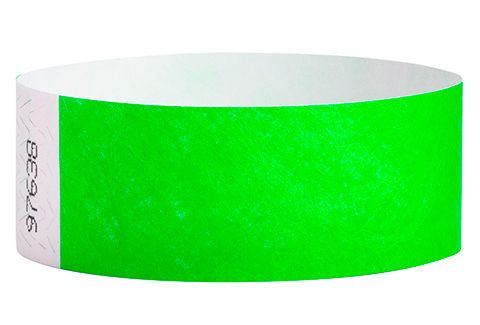 Holographic wristbands are made from a flexible and stretch-resistant plastic. They are constructed with a one-time use, plastic snap requiring the wristbands to be cut off after use. Holographic wristbands are waterproof and hold up in water for extended periods of time. Dura-Band Vinyl wristbands are made from 3 layers of vinyl material making them our toughest and most durable wristband. 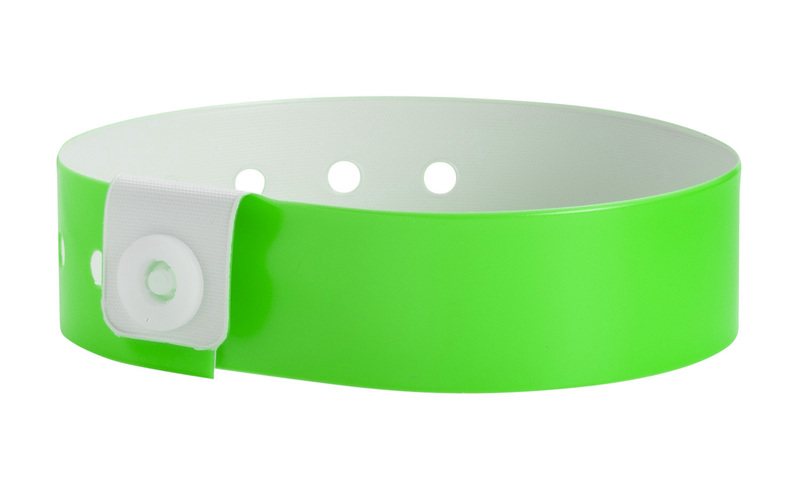 They are constructed with a one-time use, plastic snap requiring the wristband to be cut off after use. Vinyl wristbands are waterproof and can be worn for very long periods of time. The back of the vinyl wristband is white, not the color or design on the front. 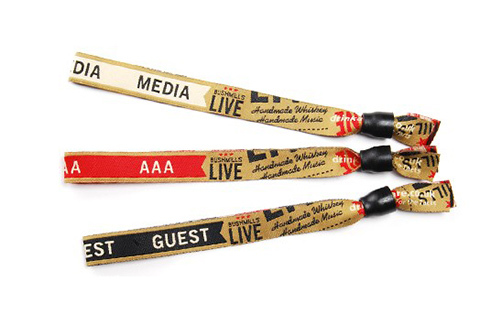 Our 3 tab vinyl wristbands include 3 removable stubs. The stubs are numbered and the band is imprinted with the disclaimer "Stubs void if detached." Vinyl Cash Tag wristbands are a great ticket alternative used for redemption for rides, food, drink, etc. Each wristband is made from 3 layers of vinyl material making them our toughest and most durable wristband. 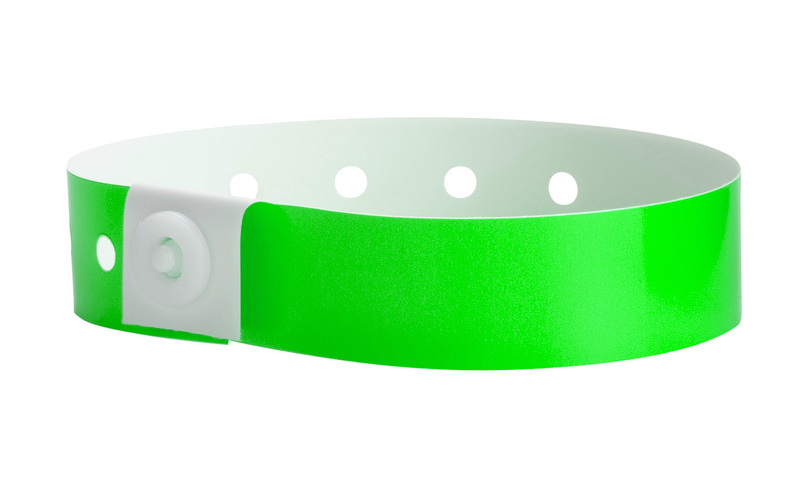 They are constructed with a one-time use, plastic snap requiring the wristband to be cut off after use. Vinyl wristbands are waterproof and can be worn for very long periods of time. Size: 3/4" (not including tabs) x 10"
Our 5 tab vinyl wristbands include 5 removable stubs. The stubs are numbered and the band is imprinted with the disclaimer "Stubs void if detached." Vinyl Cash Tag wristbands are a great ticket alternative used for redemption for rides, food, drink, etc. Customize your fabric wristbands with personal artwork, messages, and/or designs. Fabric wristbands feature two distinct styles, sublimation (designs imprinted onto the wristband) and woven (designs woven into the wristband). Both styles are extremely comfortable, super durable and perfect for festivals, concerts, sporting events, backstage/VIP passes, and make for great souvenirs or collectibles. Both sublimation and woven wristbands are made out of a cloth fabric. 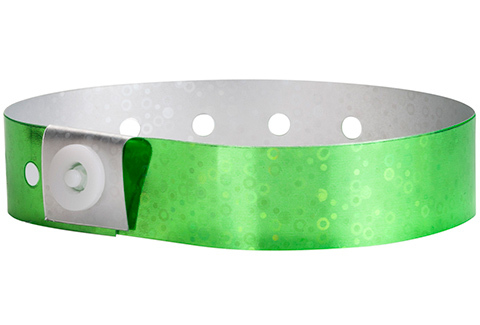 All fabric wristbands are available with barrel lock, re-usable or crimping closures. Crimping closures require a crimping tool, which we also have for sale. Our silicone wristbands are offered in three different custom styles including debossed (recessed), embossed (raised) and color imprinted (color imprint on the surface). Color imprinted bands can duplicate fine details in fonts and logos. Because the imprinted ink is on the surface of the silicone band, over a few weeks or months, depending on wear, the imprint will scrape off. If longevity is of importance, select a debossed color filled style. Silicone wristbands are perfect for raising awareness, marketing and advertising, and fund raising. Our silicone wristbands are produced with exacting standards for quality, are 100% silicone and contain no lead. Our unique app allows you to scan and validate all types of barcodes using an Android based smartphone. 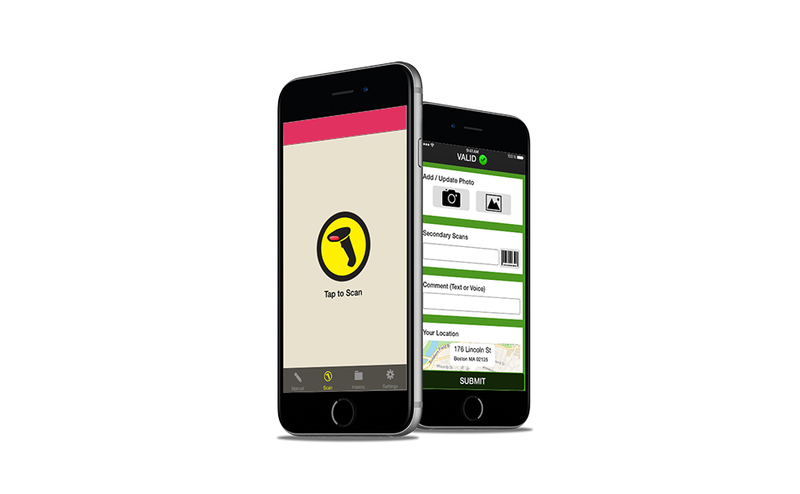 Fast and reliable, our app uses innovative technology that can be setup in minutes. Click here to download the presentation.